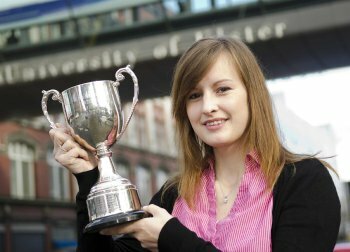 A Norwegian student, who graduated with First Class Honours from the University of Ulster, has won the Da Vinci Cup for excellence in academic performance. Lisa Storaas, an International Hotel and Tourism Management BSc student from Fredrikstad, was recently presented with the award, which recognises the highest achieving student in the strategic management module. Lise, who graduated earlier this year from the Department of Hospitality and Tourism Management at the Belfast campus, completed her placement at the Galgorm Resort and Spa near Ballymena and has recently secured a full-time position in the hotel’s reservation department. The prize, sponsored by local businessman, Garvan O’Doherty, includes a voucher for two at the Ramada Da Vinci’s Hotel Complex in Londonderry. Frances Devine, Course Director for Hotel and Tourism Management said: “The Hotel and Tourism degree programme is delighted to have the sponsorship of the Da Vinci Cup. It is a great encouragement for students to have such support from local industry. Lise, who also received a commendation in the Diploma in Industrial Studies at Ulster, plans to return to academic studies in the future to complete a Masters in Marketing and in the future she would like to work to promote Northern Ireland as a tourist destination in Norway.